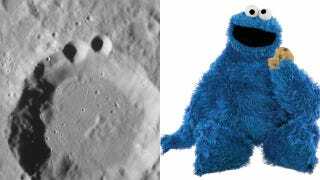 First close-up photographs of giant asteroid Vesta reveal "Snowman"
Anyone else think this looks like the Cookie Monster? The superposition of younger craters on older craters (in this case two smaller craters upon the rim of an older crater) can result in landforms that appear to resemble more familiar shapes to human eyes. More generally, the Law of Superposition allows scientists to determine which surface features pre- and postdate others, leading to a better understanding of the geological history of different regions of Mercury's surface. Good eye, NASA. Let us know when you find the Yip-Yips on Mars, will you?